High quality aluminium bodied bathroom cabinet with double sided mirror door and quality discreet hinges.This aluminium bathroom wall cabinet is manufactured in Germany and is supplied with three height adjustable glass shelves to suit individual bathroom storage requirements. 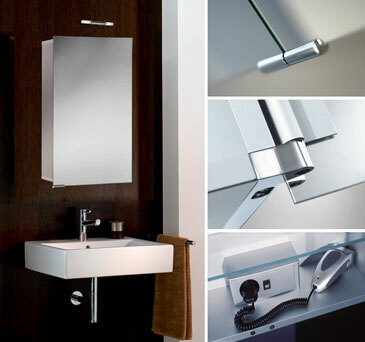 Within this range the bathroom cabinet can be supplied with lights and shaving socket or the bathroom cabinet only. W450mm x H750mm x D175mm. * Available lights & shaving socket.